Most majors are also offered as minors. Our goal isn’t just to help students graduate and find a good job. We do that and more. At Santa Clara University, we educate the whole person. Students learn to engage not only the mind but the heart too. 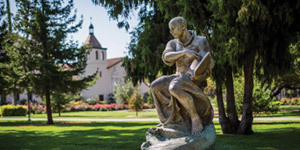 Located in Silicon Valley, Santa Clara University joins all the -innovation, creativity, and -entrepreneurship of the tech world with a Jesuit approach to education. What does that mean? Students become leaders with conscience, competence, and compassion. We call it the three C’s, but it boils down to this—our students graduate with a purpose to serve humanity in whatever field they choose. See a problem in the world, find a way to fix it. Our classes are rigorous and varied. Our student body is diverse and hard working. Different people flourish here. Whether it’s a major in Engineering or the arts, Broncos step outside their comfort zone and are better for it. They learn by doing and find their place in the solutions of tomorrow. Students leave Santa Clara driven to build a better, kinder, more humane, and sustainable world. 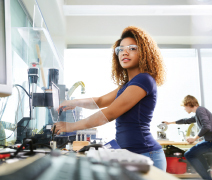 With a strong community-based learning model that distinguishes its undergraduate experience, students learn an exceptional work ethic and a willingness to take chances. They gain not only the knowledge required to succeed in a -complicated world but also the desire and -ability to change it. For exceptionally talented, high-achieving students, our -University Honors, LEAD, and Johnson Scholars programs offer opportunities to further develop leadership skills. SCU’s campus is right next to San Jose, the 10th-largest city in the US, and a short train trip to San Francisco. Our students love it in the Bay Area. Home to more than two million residents and 6,600 science and technology–related companies, the region is known for extraordinary visionaries responsible for the most significant scientific and technological advances. There are plenty of chances to get to work right away too. Internship and -employment opportunities abound. Facebook, Apple, Google, Netflix—they’re all here. Want to explore? Drive an hour in any direction and you’ll find a new adventure. With 300 days of sunshine, students at SCU enjoy the outdoors. Lounge on the beaches of Santa Cruz, hop on a trolley in San Francisco, hike beautiful redwood trails, visit Napa Valley, or check out regional attractions like Lake Tahoe and Yosemite National Park. Amid the beautiful palm trees, campus life at SCU is buzzing: NCAA Division I sports, music, theatre, guest lectures, spiritual retreats, intramural and club sports, movies, volunteer -opportunities, concerts, and more than 150 campus organizations. There’s something for everyone. 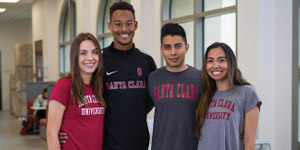 At Santa Clara University, -students realize their full potential and thrive. Here at SCU, invent the life you want to lead. Our financial aid programs can make Santa Clara University more affordable for you and your family. The financial aid programs we administer—which include need-based and merit-based aid, grants, and scholarships—help 73% of our students meet their SCU educational expenses.